Banter is the unsung hidden gem of joy in the great game. On and off the field, players almost always provide brilliant moments to chuckle and make merry about. However, not all players are of this demeanor, and some may even be guilty of having a staunch disposition, even in the face of the greatest banter. Former Manchester United legend Roy Keane may fall in this latter category, and it may be rare to see the Irishman crack up at anything. That feat, however, has now been achieved, albeit at the expense of Patrice Evra. Keane, Evra, and Ryan Giggs formed the trio of pundits for ITV, and the three Manchester United veterans certainly make for some insightful discussion. However, during one such recent debate, the unthinkable occurred. The trio was exchanging remarks regarding the current situation of left-backs at the Mancunian giants, with Patrice Evra staunchly stating the case for Ashley Young and how his once-coveted spot is now an issue of great contention for Jose Mourinho to deal with. Absolute savagery from the legend who spent his entire career at Old Trafford. 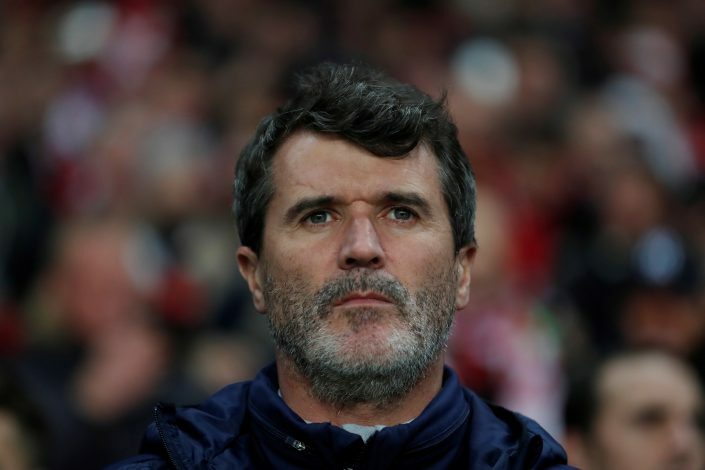 But to add to the response was the fact that even Roy Keane found it quite amusing and couldn’t help but crack a smile. Needless to say, Twitter caught on quite strongly to this, and relished the rare sight, with responses coming in plenty. Evra, himself a bit of a social media icon as of recent, seemed to take the joke in good spirits, but it was the reaction of Keane that stole the show. When will he break next?